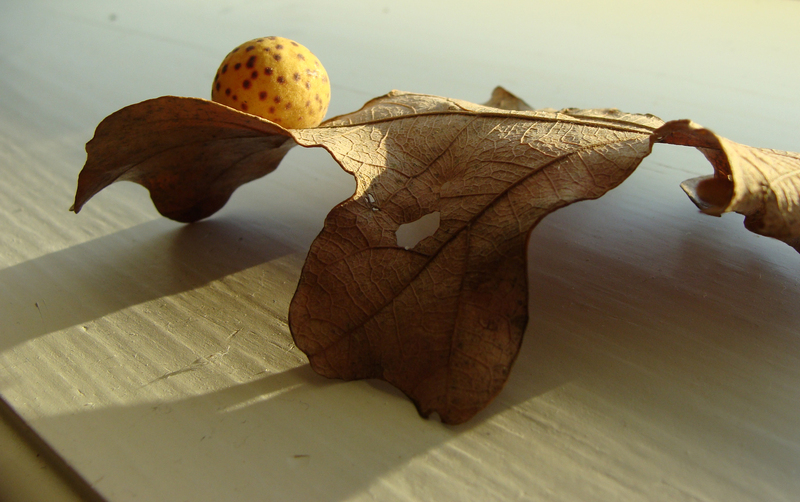 GALL -- A cheerfully spotted gall on an oak leaf. 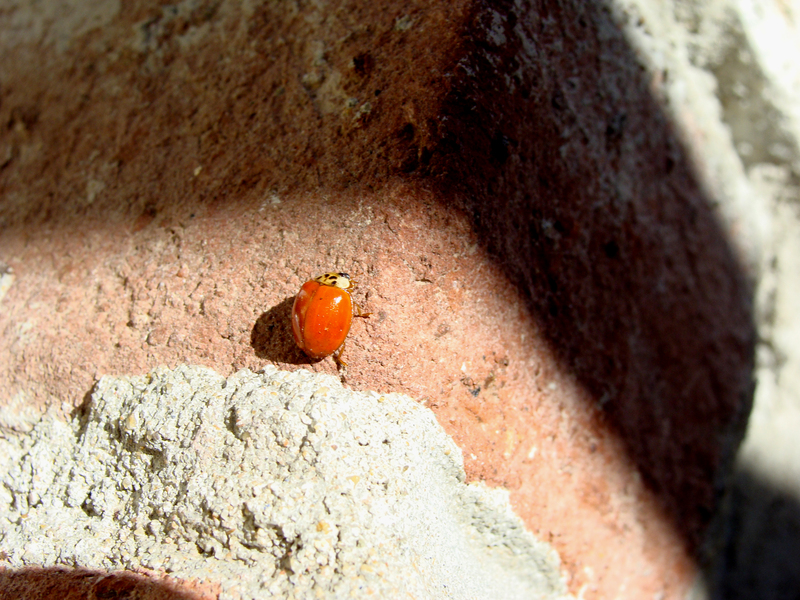 Spotted this nearly spotless ladybug on the front door. The way the shadows fell around it reminded me of old those richly moody Humphrey Bogart movies with lots of darkness, ceiling fans and Venetian blinds. It’s hard not to love beetles, even underexposed ones. 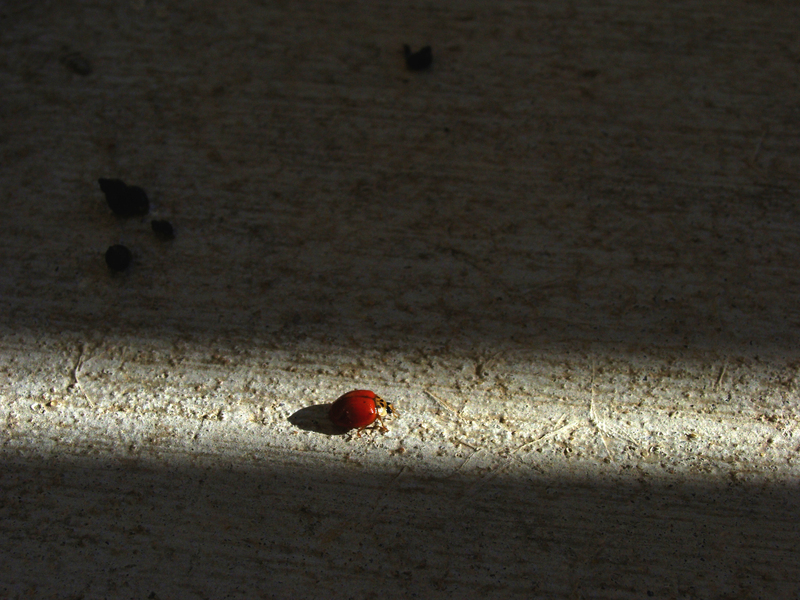 FOUND THE LIGHT -- This lady bug travels the path of light. SPOTLESS -- Well, except for that beauty mark on its right shoulder. Loi Krathong, or Loy Kratong, is a Thai festival of light and water. During the last full moon of the Thai lunar year, celebrants flock to bodies of water, even swimming pools, to set adrift a krathong, symbolically setting adrift their own flaws and while showing gratitude and respect for nature. A krathong is traditionally a lotus flower on which the celebrants place candles, incense sticks, coins or other items. Many people use rafts made of banana leaves artfully folded into a lotus shape. Many people take pride in their loi krathong style, including my cousins. 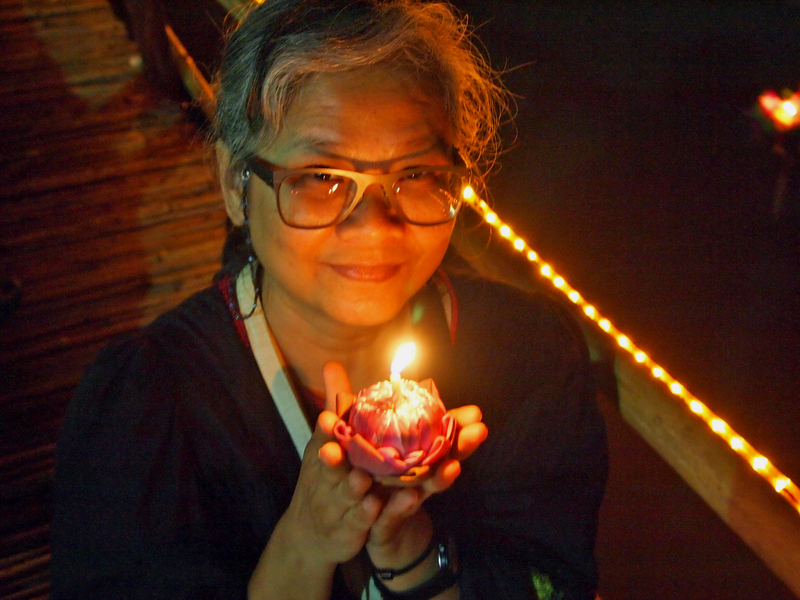 LIGHT THIS CANDLE -- Cousin Dang has her krathong ready to go -- a small pink lotus flower with a birthday candle in the middle. Loi Krathong is a joyful time. Ironically, some of the celebrations were cancelled this year in Bangkok due to flooding. Cousins Dang and Nat were in Chiang Mai to mark a birthday and Loi Krathong. Dang was making good use of her new Olympus camera. 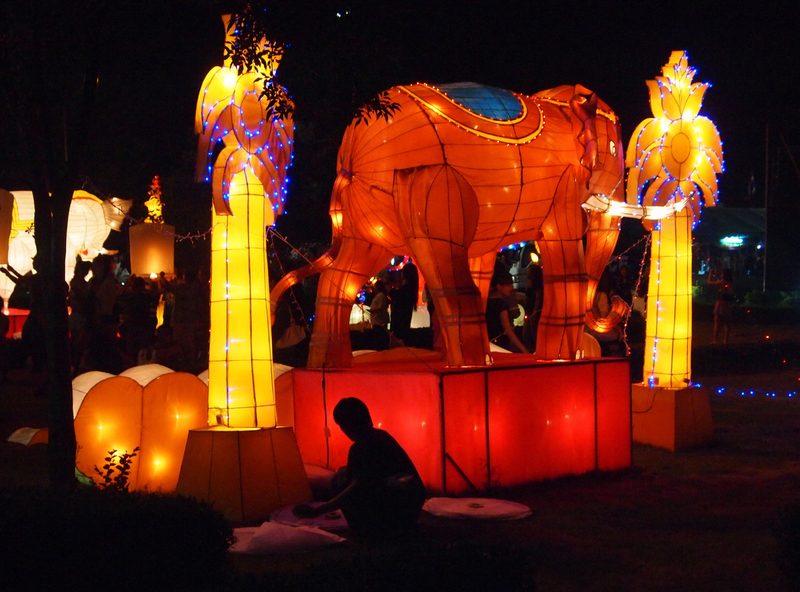 ELEPHANTINE -- Floats and lighted displays are part of the Loi Krathong festival in Chiang Mai. 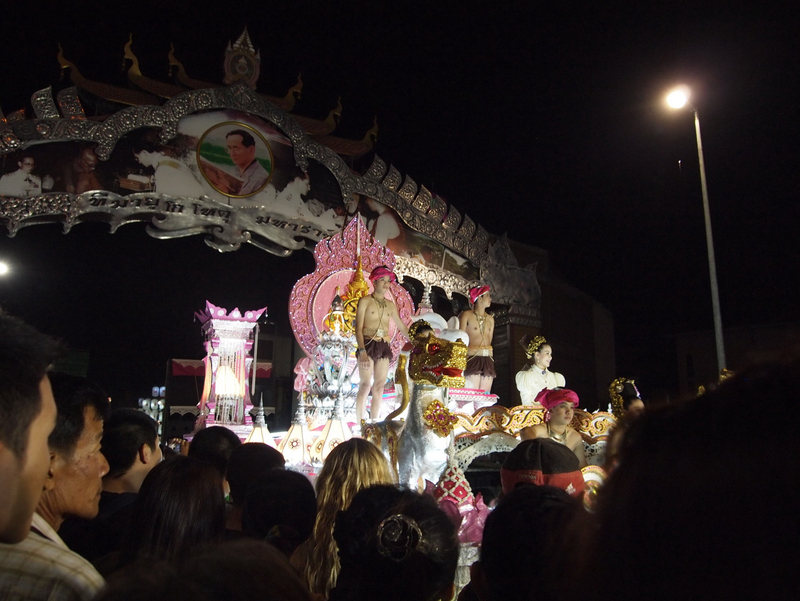 FLOATING BY -- An elaborate float that's part of the Loi Krathong celebration in Chiang Mai. 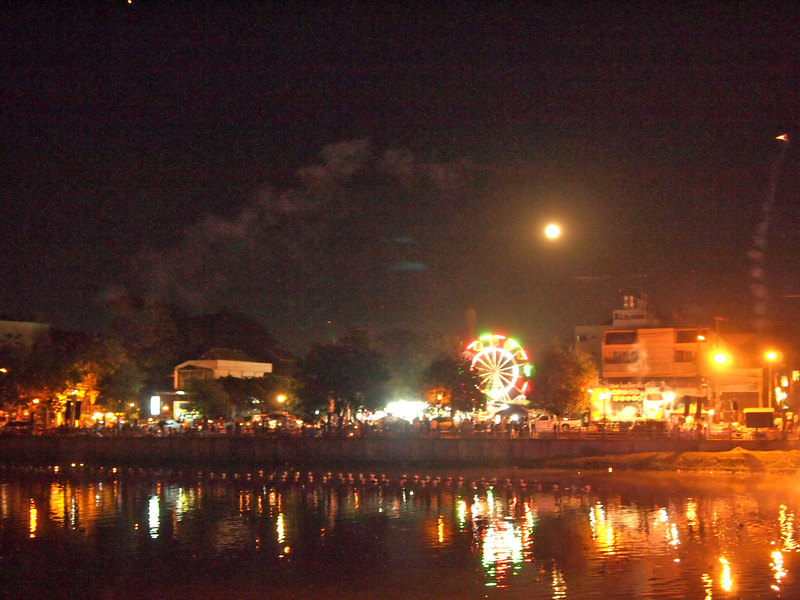 FULL MOON -- The full moon competes with a lighted ferris wheel and fireworks during the Loi Krathong celebration in Chiang Mai. 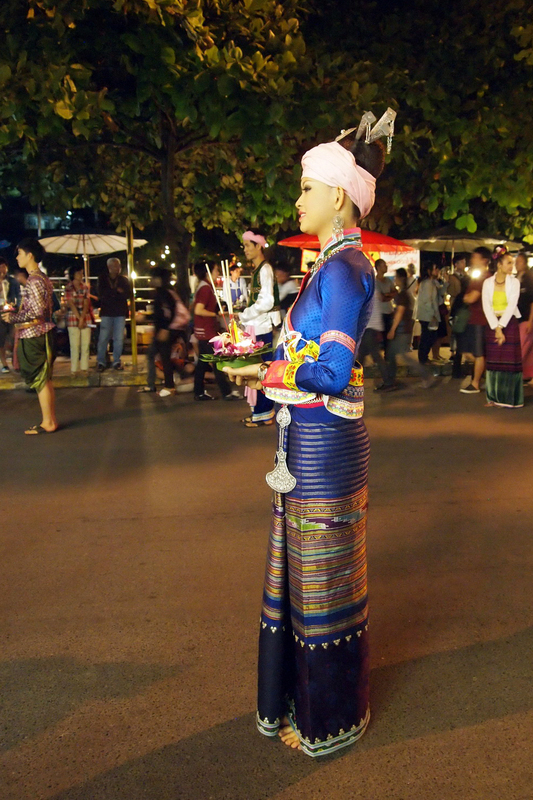 TRADITION -- A woman in traditional clothing readies her krathong for the water. 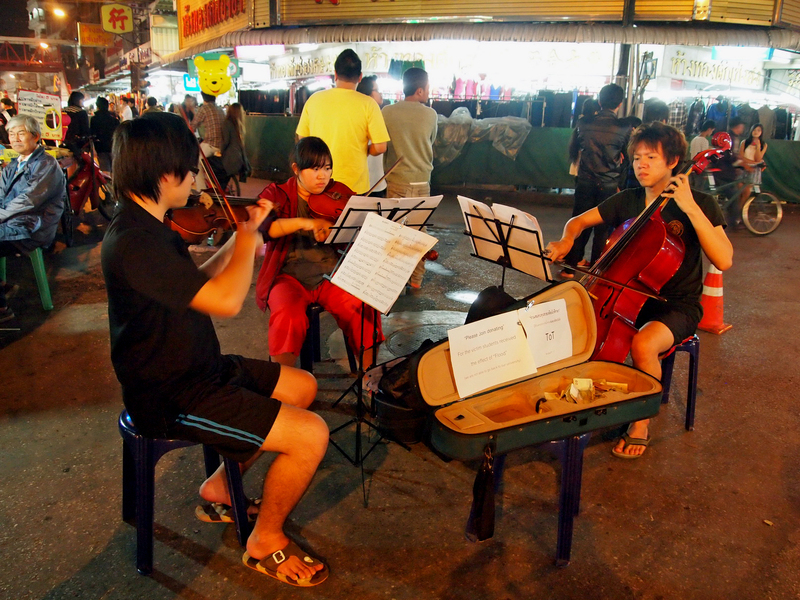 IN TUNE -- This trio of university string players performs to raise money for flood victims. 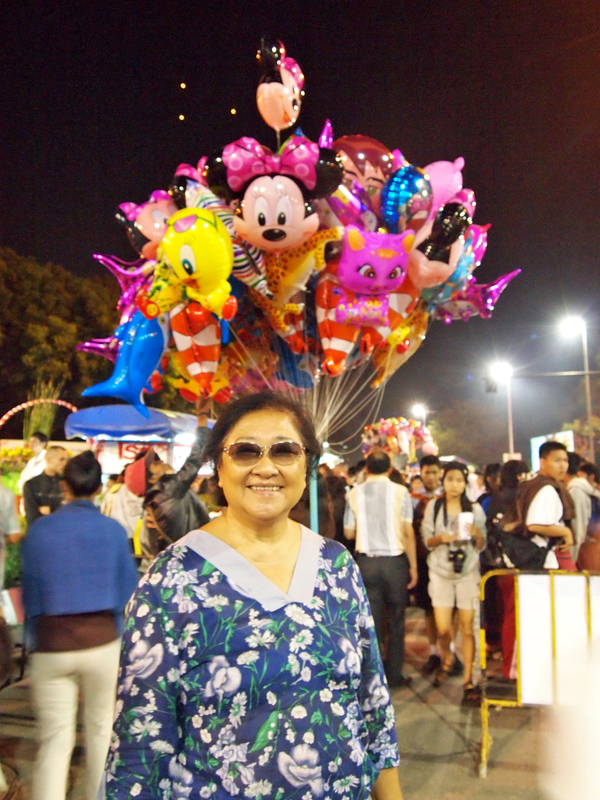 FLOATING ON AIR -- Cousin Nat enjoys the festivities with Mickey, Minnie and other inflatable cartoon favorites in the background. A look at the Out walking the dog blog reminded us of our urban coyotes. We’ve heard them at night yipping and howling. We’ve heard them at night ripping something to shreds. Closer to town, suburbanites reported their dogs and cats disappearing. One horse barn manager reported seeing a pack wander through the property in the middle of the day. Needless to say, coyotes are highly adaptable and successful in rural, urban and suburban settings. One trotted behind the office one day in March. Hands barely made it from keyboard to shutter on this low-light day. 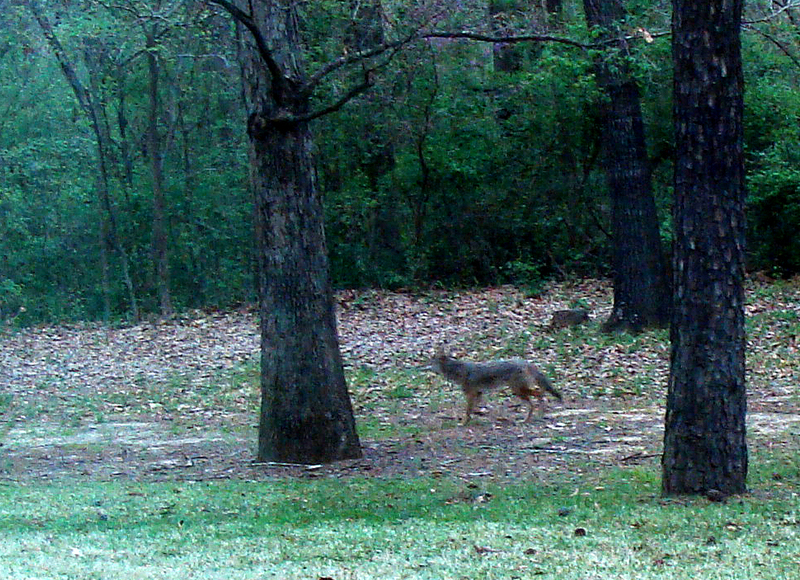 COMIN' THROUGH -- Urban coyote trots along the green belt behind the office. Visitors taking Interstate 40 westward from Tennessee were greeted with this sign over the Thanksgiving weekend. This “Welcome Center Closed” sign reminded us of the old Candid Camera classic, “Delaware is Closed.” While the video doesn’t appear online, one site has a transcript of the clip. 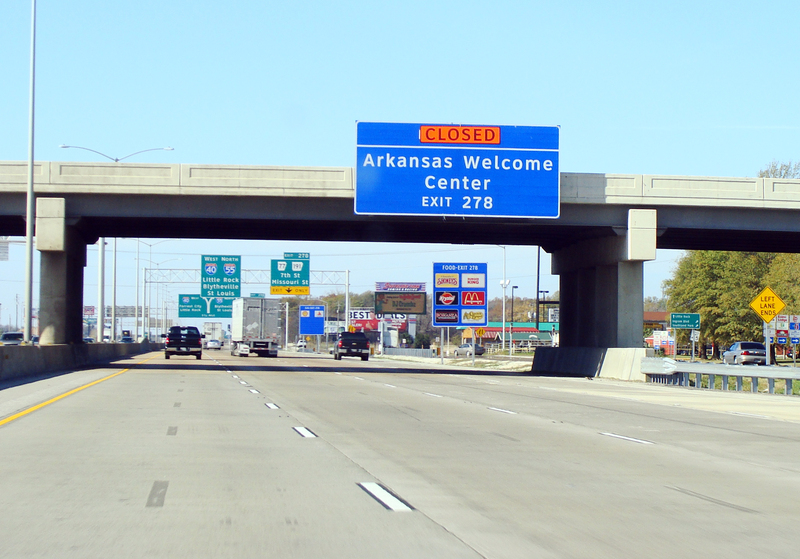 Arkansas is open for business. TRY BACK LATER -- No reflection on Southern hospitality, but the welcome center is probably getting some repairs. 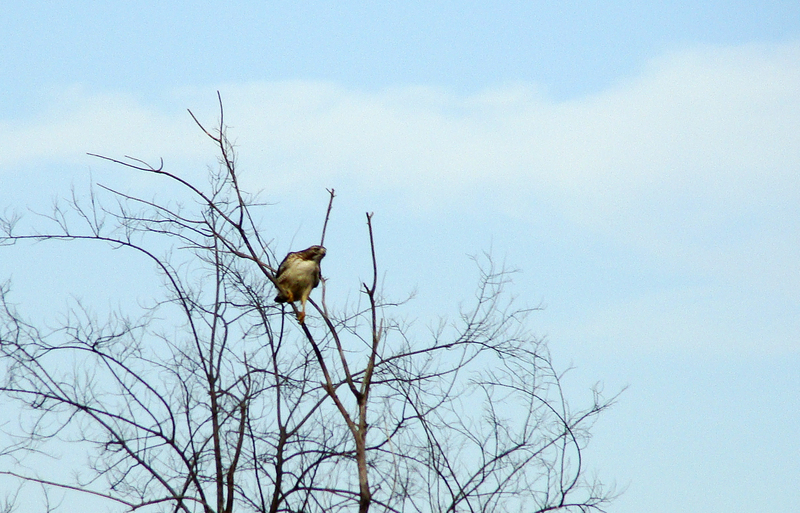 The fall-denuded trees along I-40 and U.S. 70 between Little Rock and Memphis were full of big, beefy red-tailed hawks, keen for any prey making a living below in the chaff left after the harvest of rice, soybeans and sorghum. 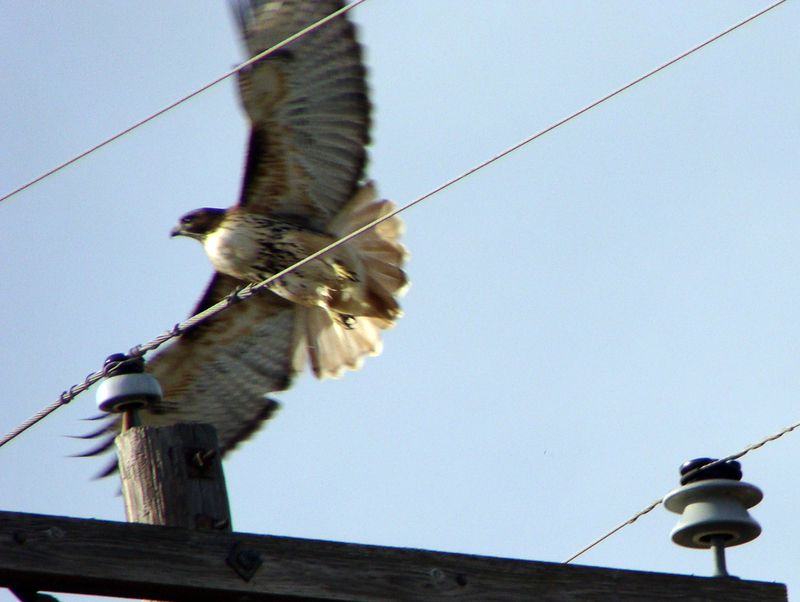 The hawks paid little heed to traffic whizzing past at highway speeds. However, rolling slowly or coming to a halt too close made the big birds spring off in a hurry. It took us several tries to get our “lazy naturalist” photography choreographed, figuring how close we could roll the car; how long it takes to frame the shot; how to push the distance to catch the bird up close and in flight. 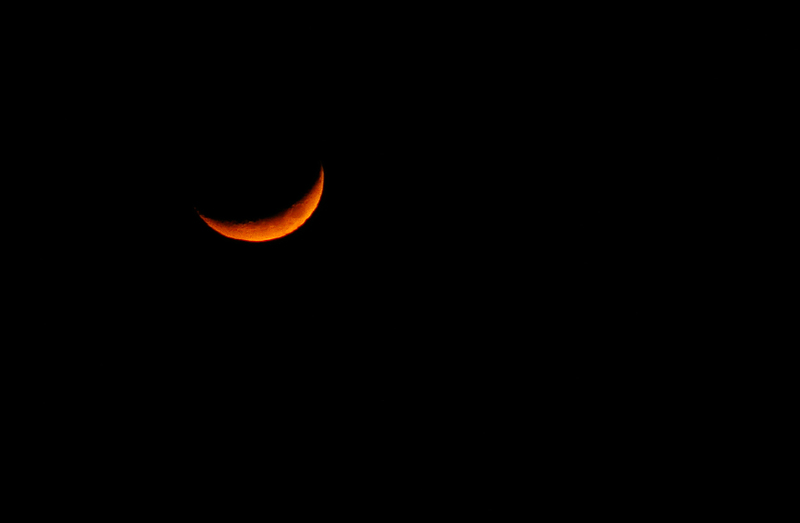 The trial and error we practiced from St. Francis County all the way to the edge of Pulaski County produced some amusing and wonderfully imperfect shots. When we finally got the driving/shooting duet coordinated, we ran out of highway, hawks and open fields. We were privileged, during one of our roadside stops, to have a red-tailed hawk make a successful strike just feet in front of the roadster. No photos, but an unforgettable closeup we’ll always have in our heads. 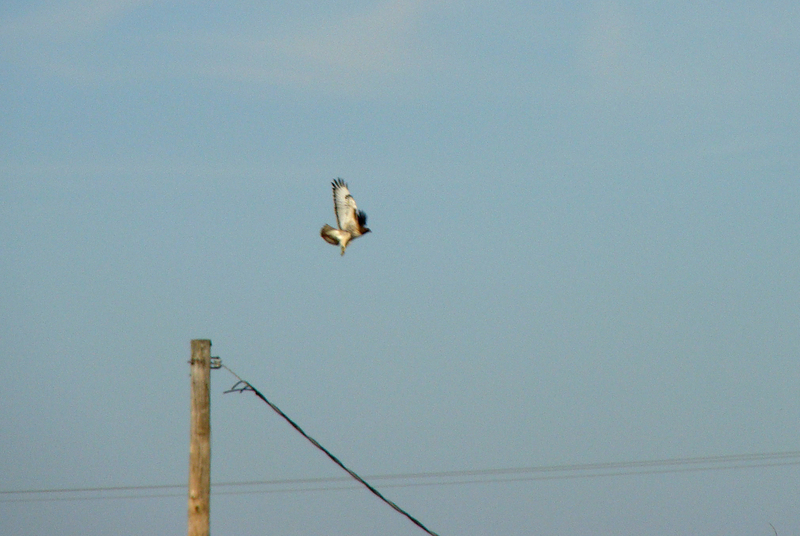 PREY DAY -- Red-tailed hawk scans the surrounding fields for a meal. Grains left in harvested fields are highly attractive to prey. LEAVING HIS PERCH -- Wary of the people below, the hawk moves off. 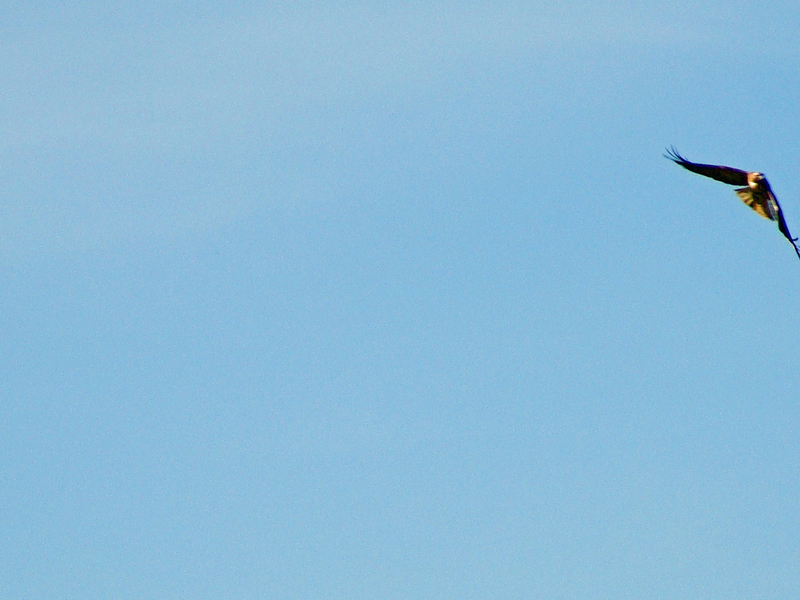 IN FLIGHT -- Red-tailed hawk in flight. Beautiful, powerful birds. A couple years ago we watched as, off in the distance, a helicopter carefully followed high-voltage transmission lines, with a long object suspended from an equally long cable. The ‘copter’s back and forth flights mystified us then, but we’d forgotten about it until last weekend when, once again, we began to feel the vibration of approaching helicopter rotors beating the air. Looking south, flying along the power lines that march across and along a neighboring ridge was the Hughes helicopter, again trailing its long payload. Our mystery was solved this weekend. On the way back from a Thanksgiving in Memphis, traffic was halted on U.S 70. Yards away was the helicopter, with its long tail, slowly moving parallel to the power lines flanking the highway. We were so close we could finally see its payload — a long string of circular saw blades. 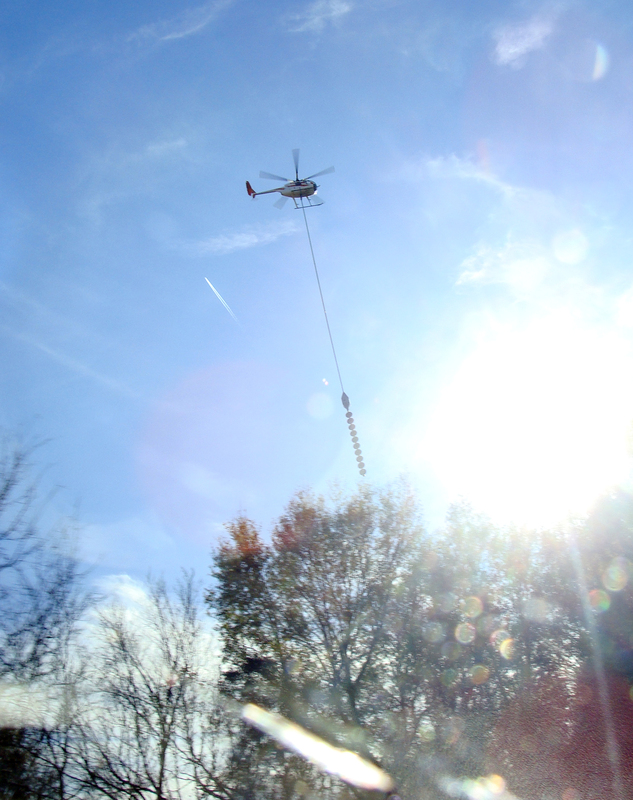 The Aerial Solutions helicopter and its skilled pilot were performing sky-based hedge trimming for Entergy, a power company that serves Arkansas, Louisiana and Mississippi. 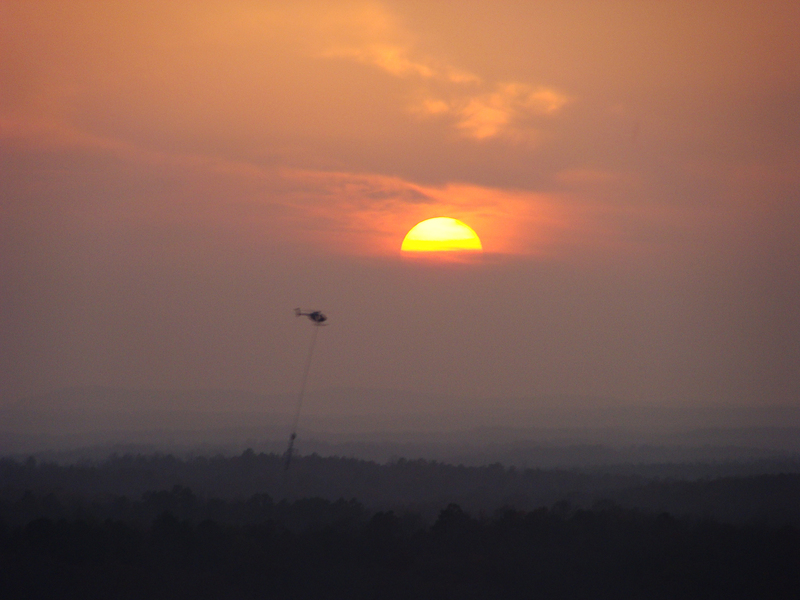 END OF THE DAY --Tree-trimming helicopter races the sun to finish cleaning power line rights-of-way in western Pulaski County. 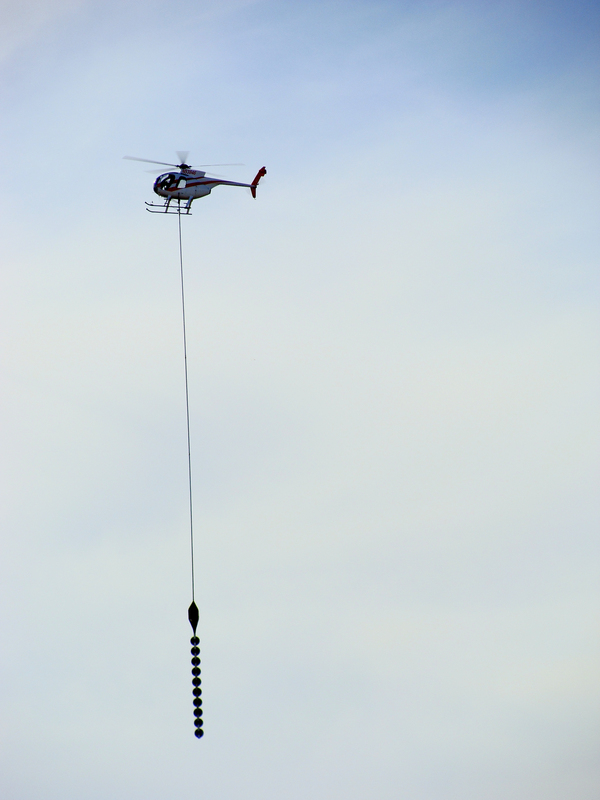 MAKING THE CUT -- Shot showing the helicopter moving its saw to another location. 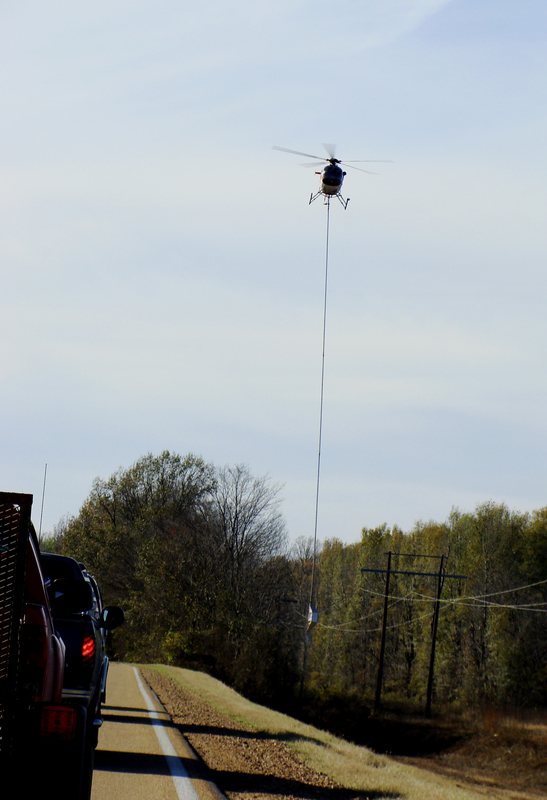 STAYING IN TRIM -- The flying saw plies its trade along U.S. 70 in eastern Arkansas. FLARES -- Gratuitous shot into the sun featuring flares. After the rain still life. 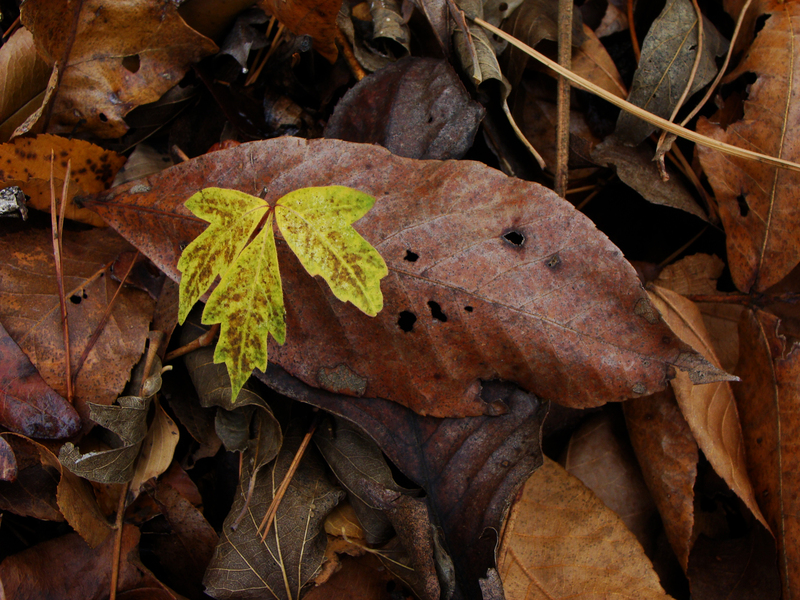 IVY -- The leaves of three make the change to its autumn look. Livin’ the green life. Found this little gem in the driveway. 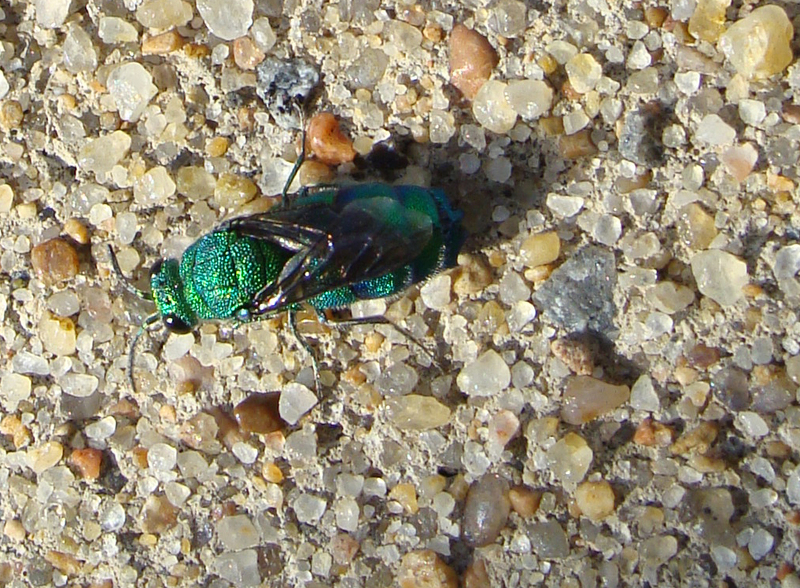 SHINY -- Not an emerald ash borer, but a green sweat bee.